Comments: Rich was always a steady runner in the modified ranks at Flemington. 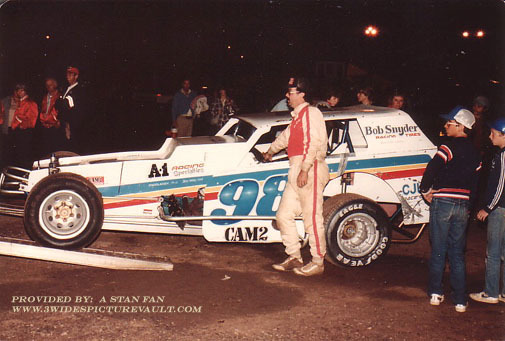 I think this was Rick's own car, but Rick was also known for piloting the Barry Schenk owned "A" car. 05/25/03 JMGBILLS I was always a fan of Rick Holden because his cars were meticulous. If I recall they were usually lettered by Scottie Kania when they were sponsored by Spencer Asphalt and Paving, Quakerbrige Auto Parts and Johnnie's Truck Stop. I also recall Rick preferred to run Goodyear Eagle Tires instead of the McCreary's or Hoosiers that had so much success at "The Square".